Important Notice 22Apr2019, 09:44. Our phones (via VirginMedia) have been out of operation since early this morning. We are patiently awaiting the restoration of their network. Made in Ireland. 12 sheets & 12 envelopes in a clear biodegradable bag using our Cairn Straw Cream 120g paper and Hairy Kraft C6 envelopes. Fine drawing of bog cotton on each sheet in the bottom left corner. Made in Ireland. 12 sheets & 12 envelopes in a clear biodegradable bag using our Cairn Straw White 120g paper and Hairy Kraft C6 envelopes. Wildflowers printed on each sheet in the bottom left corner. 4 each of: bluebell & primrose,foxglove & St. John's Wort, snowdrop & winter aconite. Made in Ireland. 15 sheets, 5 notelets & 15 envelopes. Bog cotton design printed on each sheet. Speckled birch 110g recycled paper sheets with hairy brown recycled C6 envelopes. Made in Ireland. 12 sheets with Irish woodland wildflower designs printed on ivory 100g recycled paper. 12 ivory recycled C6 envelopes included in the corrugated folder. 3 sheets each of: bluebell & primrose, foxglove & St. John's Wort, bramble & cuckoo pint, snowdrop & winter aconite, representing the four seasons. Cards by Baglady Designs. Designed and produced in Ireland. Printed on recycled card with C6 recycled envelope. Packed in a compostable clear PLA bag made from renewable cornstarch. 100% recycled paper and envelopes, designed and printed in Ireland, packed in clear biodegradable bags. 4 notelets and envelopes per pack. 100% recycled. 80 plain sheets in assorted colours, design on the front (sheep, cow, goat or bog cotton), spiral bound at the top. 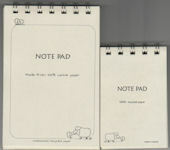 Available in A6 and A7, MADE IN IRELAND by Klee Paper. 100% unbleached recycled paper. 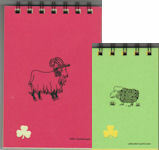 Light grey colour, 75 sheets with our sheep printed in the bottom corner on each, spiral bound at the top. Available in A6 and A7. MADE IN IRELAND by Klee Paper. 100% recycled. 5x4cm, 60 coloured plain sheets, brown sheep cover, wire bound on the left. Made in Ireland. 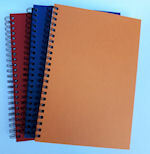 Spiral A5 ruled notebooks with soft covers, recycled paper, sheets are perforated to tear out easily.